EFFECT: This is one of the most baffling decks yet created! This makes the old brainwave deck obsolete. 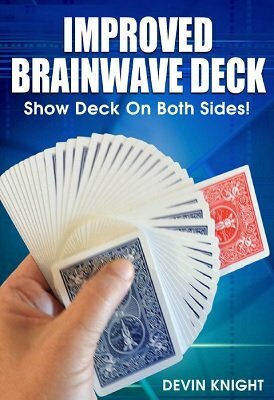 It combines the Invisible Deck with the Brainwave Deck. Two of the most popular trick decks in the world. Tell your spectators that you reversed a card in the deck on the table. The deck is in full view from the start and there is ONLY ONE Deck used. It is not switched. Any one calls out any card. There are no restrictions. Any one of the 52 cards can be named. Both fronts and backs of the cards are shown. The performer removes the deck from the case. He spreads the cards until he comes to a face-down BLUE back card and up jogs it leaving it in the same position. He continues spreading through the entire deck face up showing no other reversed cards. WHAT MAKES THIS DECK DIFFERENT? The spectators don't just see only even or odd cards as in the standard invisible deck. When the performer spreads the cards they see ALL 13 VALUES IN BOTH RED AND BLACK SUITS! No more worry about astute spectators noticing that only odd or even cards are showing. No more worry about spreading the deck and no Aces showing. Regardless of which card is named, all 13 values are seen. This is a major breakthrough with this type of deck. The upjogged blue card is removed and placed on the table or given to a spectator to hold. The deck is turned over and spread from top to bottom showing ALL RED CARDS. Not half-way, but the entire deck is spread from top to bottom! When the blue-backed card is turned over, it is seen to be the freely named card. The spectator may take the blue-backed card and examine it. It is actually a single blue-back card, not two cards stuck together to create the illusion of blue back card. NO FORCES of any kind. 100% free choice. Alternative Handling: Deck is on table in full view, any card is named and the deck is removed face up. The performer slowly moves cards one at a time from the top to bottom to show no tricky or sleights are being done. He continues this until he comes to one face-down blue backed card. This is dealt face down to the table. The performer continues spreading through the cards showing all of them face up. Again, the spectators see all 13 values in both red and black suits. The performer flips over the deck, and spreads all the cards from top to bottom showing a red deck. When the blue card on the table (which can be examined) is turned over it is found to be the named card. Baffling beyond words. Easy to Do...NO SLEIGHTS. No embarrassing mistakes by counting through face-down cards and showing the wrong card reversed, which happened on national TV to a well-known performer. 100% Foolproof and one dandy of a fooler! You can do this even if you have had trouble in the past handling an Invisible Deck or Brainwave deck. You can separate the cards with NO FUMBLING. Resets quickly for strolling gigs. Complete step-by-step details on how to make this deck. This deck does not use standard roughing fluid. To construct this deck you will need to buy or own a roughing stick sold by dealers or Science Friction spray or Plasti Dip spray sold in hardware stores and on Amazon.com. Excellent! No worries about cards sticking together like the decks sold in magic stores. Very thorough, as are all of Devin's products.